An east Tennessee legend will be represented on one of the cars competing for the win on Saturday afternoon in the NASCAR Xfinity Series race when that series rolls into the Bristol Motor Speedway for the Alsco 300. 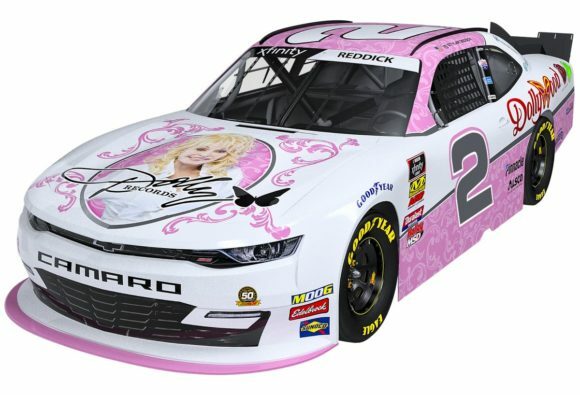 Country music superstar and Sevier County native Dolly Parton will have her likeness on the hood of Tyler Reddick’s Chevrolet while Dollywood, a theme park located in the resort town of Pigeon Forge, will have its name placed on the side of the No. 2 ride prepared by Richard Childress Racing. Reddick, the 2018 NASCAR Xfinity Series champion, currently leads the series standings after six races. He has yet to win in 2019 but has compiled four top-5 and five top-10 results so far. Dolly Parton is associated with numerous businesses and organizations in Sevier County and throughout east Tennessee. Dollywood’s DreamMore Resort & Spa, Dolly Parton’s Imagination Library, and Dolly Parton’s Stampede Dinner Attraction are among those to be included in the Camaro’s scheme. Reddick, who hails from Corning, California, has won a total of three Xfinity Series races during his career. He also has three wins in NASCAR Gander Outdoors Truck Series competition. He scored two top-10 finishes in the two races held at Bristol Motor Speedway in 2018.